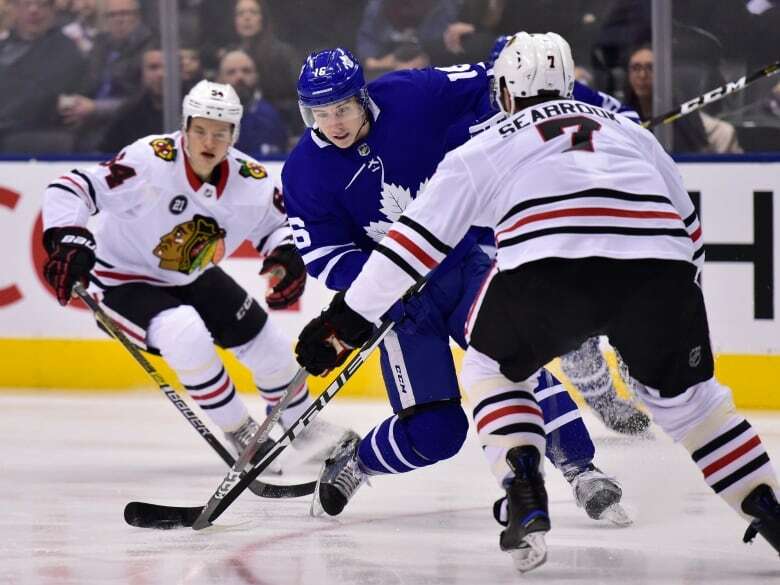 Brendan Perlini had a goal and two assists as the Chicago Blackhawks held off a furious Toronto comeback to defeat the Maple Leafs 5-4 on Wednesday night. Brandon Saad, with a goal and an assist, Duncan Keith, Dominik Kahun and Alex DeBrincat also scored as Chicago (31-30-9) jumped out to a 5-0 lead before being forced to hang on. Dylan Strome added two assists for the Blackhawks, who have won four straight and crept within four points of the Arizona Coyotes for the second wild-card spot in the Western Conference. Corey Crawford stopped 17-of-18 shots through two periods before leaving the game due to illness. Colin Delia turned aside 26 shots, all in the the third, in relief. Auston Matthews, Morgan Rielly and Andreas Johnsson each had a goal and an assist for Toronto (42-23-5), which came off Monday's listless 6-2 home loss to the Tampa Bay Lightning with a sloppy, uninspired performance through two periods that raises more questions about the team's readiness for the playoffs. John Tavares also scored for the Leafs, while William Nylander and Mitch Marner had two assists each. Frederik Andersen allowed four goals on 14 shots in the first before getting pulled in favour of Garret Sparks, who finished with 24 saves. The Leafs had a built-in excuse on the heels of the loss to the Lightning — the players got just one day off following a three-game road trip through Western Canada — but only had themselves to blame against an opponent that started the night 20 points back in the NHL's overall standings. The Blackhawks continued to press and went up by two at 12:55 when Perlini took a pass from Strome, cut into the middle and whipped a knuckling puck against the grain on Andersen for his 12th of the campaign and fifth in the last four games. Toronto showed some life on the next few shifts — Connor Brown had a shot that looked like it was going in blocked before Nylander hit the post — only to watch as the visitors soon put the game out of reach. Tavares lost the puck at the offensive blue line, leading to a 2-on-1 break the other way that saw Patrick Kane feed Kahun, who buried his 12th at 17:13. Andersen received Bronx cheer from the ornery Scotiabank Arena crowd on his next save, but was completely hung out to dry by teammates on Chicago's fourth of the period. Leafs defencemen Ron Hainsey, who finished the opening 20 minutes an ugly minus-3, motioned for fourth line centre Frederik Gauthier to cover in front, but the message wasn't received, leaving Saad all alone to tuck his 23rd beyond Andersen as four Toronto players were caught puck-watching. 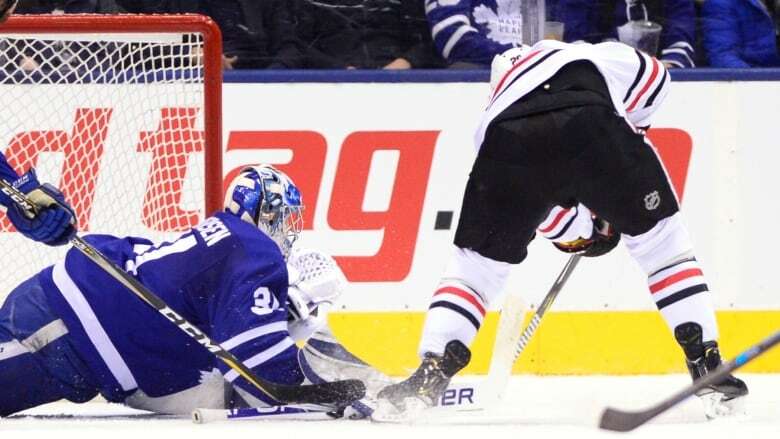 Chicago made it 5-0 at 12:32 when Leafs defenceman Nikita Zaitsev's indecision led to DeBrincat taking a pass from Perlini and roofing a shot past Sparks for his 38th. Toronto finally got on the board with 1:33 left in the period when Rielly, who on Tuesday was cleared of uttering an alleged homophobic slur in the Tampa game, had his shot deflected in by Johnsson for his 20th. Rielly then made it 5-3 on the power play when his shot through traffic found its way past Delia at 10:55 before the defenceman hit the post moments later. After being held out of the lineup Monday for precautionary reasons because of an illness, Toronto announced Kasperi Kapanen has been diagnosed with a concussion. The Leafs were also minus Zach Hyman (flu), while defencemen Jake Gardiner (back) and Travis Dermott (shoulder) remain on the shelf. Matthews and Kane went toe-to-toe in the teams' only other meeting in early October — a wild 7-6 overtime victory for the Leafs. Matthews put Toronto up 6-5 with just over a minute left in regulation, placing his glove by his ear in a mock Hulk Hogan celebration. Kane mimicked the action with 29 seconds left after tying it before Matthews helped set up Rielly's winner in the extra period. "It was pretty fun that night ... something you can always remember," Matthews recalled following the morning skate. "Pretty cool to go head-to-head and have that kind of exchange with a guy like him who I've looked up." Wednesday would prove to be much less enjoyable for Matthews and the Leafs.